Maui Notary specializes in Mortgage/Real Estate Documents at your convenience. In most cases Maui Notary can be anywhere in Maui County within a reasonable time frame. Maui Notary services all of Maui County, including the Islands of Moloka'i and Lana'i. 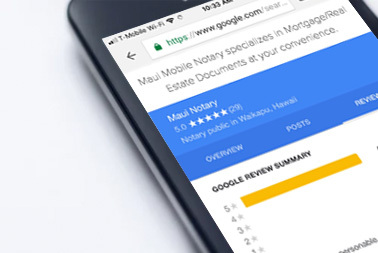 See how others have rated our 5 star service and what they're saying about Maui Notary. Serving Maui County for over 15 years. From last minute trips to Wailea or The Ritz Carlton in Kapalua and all the other resorts on Maui. Long Drives to Hana, ferry over to Lana'i and flight to Moloka'i. We can definitely find a way to meet your needs! Maui Notary can notarize anything that requires a Notary Public. Cash, Check or Debit/Credit Accepted.